Tierra del Fuego or ‘ Land of fire’ gets its name not from some volcanic geological phenomenon, but from the myriad of fires lit by the native Yanghan or Ona people who lived on the island. These tough people were distinct again. When Charles Darwin travelled through the region in 1833 on his exploratory missions, he noted that the people of this region had very little clothing on despite the harsh climate. It was common to see the people mostly naked, in thin animal skins and often walking barefoot in the snow. They would huddle round fires to keep warm and the hundreds of small fires viewed from the European boats passing through the region gave rise to the name Tierra del Fuego. The Yanghan hunted marine animals in their reed or skin boats (often with a fire burning on top for warmth!) and would cover their bodies with animal fat for additional warmth. Sadly, the Europeans also brought disease, religion, culture and assimilation to these people and they now number in their hundreds rather than the tens of thousands that used to live here. But in the few pure blooded Yanghan that still exist, a genetic marker shows they have a higher metabolism than other people in the same region and can maintain a higher and more stable body temperature despite the harsh climate and lack of clothing. A similar DNA marker has also been found in the Inuit and Eskimo communities in Alaska and Northern Canada. Unfortunately, I don't have the same marker and I dug out my winter jacket from the bottom of of my panniers. The temperature is not actually that cold. I'd estimate around 10-15 Celsius, but combined with a sweating body and the ever present wind, keeps you cool all day. 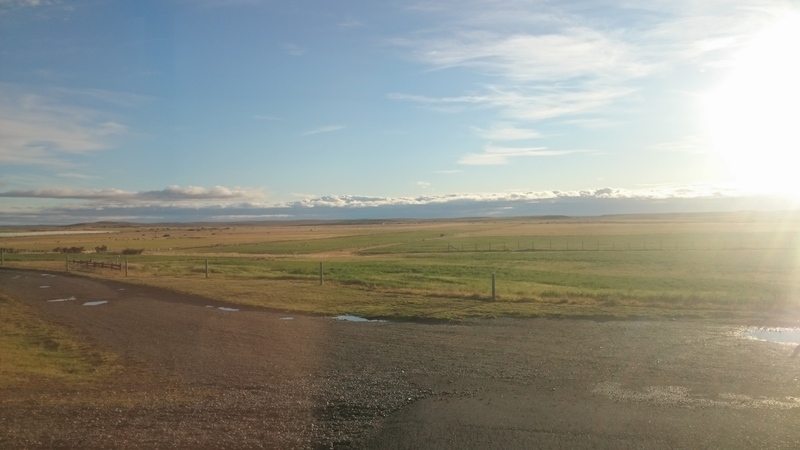 I rode directly south from Rio Gallegos, through a police another police checkpoint who, for the first time actually took my details down correctly without any prompting! I have passed through 15-20 checkpoints in Argentina alone. And probably the same number again in the previous 15 countries. I'm not sure why Argentina is so much more cautious in this respect, but they seem to enjoy interrupting my journey for a few pointless minutes and I wish I only felt the same! A few kilometres from the border with Chile, I found a Guanaco stuck in a fence. It seems my theory was proven correct, unfortunately. Having seen a small group of Guanacos running away rapidly a few moments before I can only assume I may have been responsible for this poor animals suffering. After a few minutes struggling to cut the hardened steel wire with my barely functioning Leatherman multitool, While at the same time trying not to get kicked by the panicked animals extremely sharp toe nails and the wire split with a piercing ZZINNGG!!!! and the freed animal almost did a back flip as it stood up and sprinted away from me. I continued my journey and a few kilometres later crossed the border into Chile again. From the border to Punta Arenas is approximately 150 very flat kilometres. Which in the right circumstances is quite achievable in a day. But with Patagonia's infamous winds left me struggling again. By late afternoon, I had only managed around 50 kilometres and ended up at a restaurant. The only restaurant in a small junction town which didn't appear to have a name. The lady there prepared me a pretty good, but basic boiled Lamb meal with some burned Potatoes. Cheap but filling. I asked about the route ahead and after finding out there was nothing till Punta Arenas I asked about camping in their yard. "Yes anywhere you like", she replied. "Many people camp under that tree" She said pointing to a fallen willow some way in the distance. I opted for a little more security of their yard with its oddly sneezing guard dog! Despite being next to the noisy road, I slept well, but the wind picked up in the early hours of the morning and rattled my tent. After breakfast and using up the last of my Chile Pesos, I set off but knew it was going to be another tough day pedalling through a cross wind. This land is very isolated. There is the occasional Estancia. A farm house and complex. These huge farms spread over vast areas of the land farming mainly Sheep in this part of the world. The land surrounding seems arid with the grasses yellow cracked and dried by the constant winds, and the few streams I pass are dirty, smelly and barely a trickle. It's clear from the shape of the land that a lot of water does flow through here, but as I am still confused by the opposite seasons, I am not sure when exactly. The lady back in the restaurant could not prepare me a sandwich I asked for. Her bread was home made and still being made and baked. I didn't want to wait a couple more hours she indicated before it would be ready. So by late afternoon I was cold, tired and hungry. 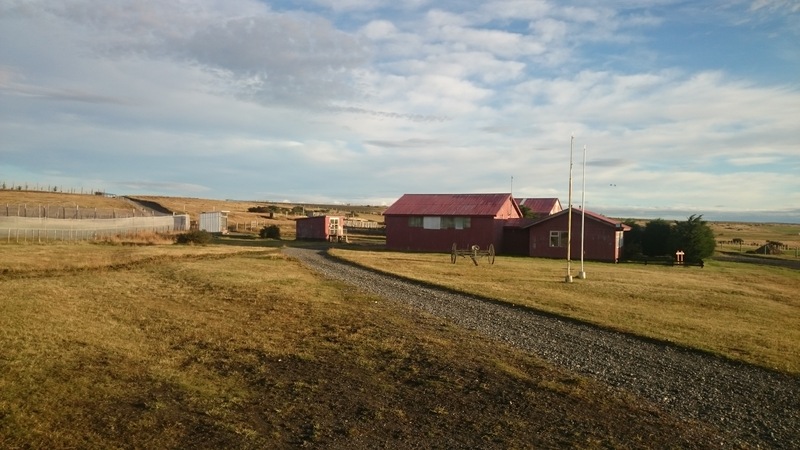 An Estancia, a farmhouse appeared on the roadside. Unusual, as they are often set off the road by quite a long way. I needed water but also though I may be able to hitch the last 50 kilometres to Punta Arenas. I sat on the roadside for around 30 minutes but no traffic passed. Apart from a minibus going into the Estancia. I walked the few hundred metres and knocked on a door next to the minibus. Lucio answered and filled my bottles. He was a youngish lad. Thick shouldered and looked like a farm worker in his rubber boots, old trousers and shirt. And stench of sheep! "You look tired" he told me. I explained, I was struggling in the wind and while I didn't plan on stopping here, I began asking about the possibility of camping in a corner. "You need to speak to my boss" he indicated to a small building on the other side of the farm yard. I wandered over as the minibus, now full of workers drove off and left the yard silent apart from the wind. I walked over to the office building and knocked on the door. I walked in being careful not to release and wayward kitties and knocked on a second door with a light flooding from the crack underneath. The Boss, was deep in work and looked at me confused for a moment, as I explained who I was. After a further moment of explanation, his brain focused and with a big grin, he said "Camping? Noooo Way!! We can do better than that..."
We walked back to the first building chatting about my adventures. Lucio was inside lighting a wood fire and I was shown to one of the several bedrooms in the building. "Make yourself at home!" I was told and after hauling my bike and gear inside, I settled in the end bedroom. After a hot shower, I prepared some of the Pasta I had been carrying and settled into the armchair next to the fire. This wasn't an normal Estancia farm. It was in fact, a Government run experimental food laboratory and training centre. One of several in the region. While that sounds a little sinister, it was a farm that was experimenting with new techniques for growing crops and animals in this harsh climate. Naturally, crops that thrive in warm damp northern climates would not survive long or grow well in the cool arid and dry climate here. The same with the animals. Sheep thrive here, but Cows, Chickens and Pigs prefer a more temperate climate. So they experimented with different methods for improving the yields of both plant and animal to feed the population. They did this by trialling crops from other similar regions of the world and animals that had been selectively bred to be better adapted to the Patagonia Climate. No genetic modification and the minimal use of chemicals. And no pigs in warm jackets, or chickens wearing socks, I was told. Slightly more sinister though, were several roadside minefields. As I came around one corner, I scared another group of Guanaco, several of whom leapt over the fence and straight into a clearly marked field of mines. A safe distance away, and they stopped and looked at me as I pedalled away hoping that I was not about to hear a loud explosion and see Guanaco body parts flying over my head. If it did happen, I was out of earshot. But I did wonder why there were so many fields in the region. What are the military doing here? The final 50 or so kilometres to Punta Arenas were helped by a change of wind direction and though an ice storm forced me to stop and put on my waterproofs, I arrived in the surprisingly modern city and a couple of days of rest in the Hostal Patagonia, next to the main plaza. The name was misleading though. As In fact it wasn't a hostel, but a hotel. And as I could not convert the prices I didn't realise how expensive it was until after I paid! Still it was very comfortable. As I arrived on a Sunday, of course all the laundries were closed and I had hoped to leave on Monday. I had lost track of time, as I so often do. The ferry to Porvenir runs every day so I was keen to keep moving. But soon realising I had made a mistake both with my timing and my timetables. The ferry did not run on Mondays, so I chose to pay for an additional expensive night, partly as I was now comfortable, had a super fast internet connection and as the lady chef took sympathy on me and offered to wash my clothes at home, I couldn't leave until she returned them. Crossing the bay to Porvenir was smooth and pleasant. I always imagined the straits of Magellan to be a turbid and chaotic as two of the world's largest and most powerful oceans fought and battled in this narrow canal at the bottom of the world. Maybe it is more violent in other seasons, but today was a perfectly calm, flat day and sitting on the deck, watching seabirds, giant jellyfish and as we arrived into Porvenir, a pod of Dolphins came alongside to play in the wake created by the ferry. It was amazing watching them for 15 minutes or so, before they got bored and swam off and the ferry navigated into port. As I pedalled the 4 kilometres into the small town, I asked at three hostels for accommodation, but they were all full. At the fourth, I met with the two other cyclists I had travelled with on the ferry. Apart from a mutual nod on the ferry, I didn't speak to them. But now it seems we were in the same hotel, we introduced and started chatting. We were soon joined by another Austrian cyclist exiting the hostel. "We are just checking out, there should be rooms available" he commented. As the group chatted I went in and paid for a room for then night. Returning outside, the Austrian started to ask me about the road north. Mauro and Lucy, the two Brazilian cyclists went to also check in. "Er, What is Peru like, Er... What about Bolivia?!" Before I answered the first question. As I explained, about the roads in Peru and Bolivia, I heard a crash at the end of the road behind me. A cyclist fell off his bike. But within a moment stood up and tried to ride off again. A second later he fell off again. "What is that guy doing, Is he OK do you think?" I commented. "Yes he looks it, What about Bolivia..." the Austrian continued, with some urgency. "Hey! Have you seen our bikes?!" His wifes bike was gone, but his bike was currently on its side in the middle of the road, with a drunk bike thief trying to stand up and ride off again. Mauro sprinted down the road shouting Brazilian expletives and Lucy followed him a moment later. I was a little stunned that I had been standing with my back to the bikes and the two thieves had literally taken them from behind me. The Austrian must have seen them. "I'll go see of I can chase them I said. I dumped my bags in reception quickly and asked the staff to call the police. Then returning to grab my bike. The Austrian asked me for my email address. "Maybe I can send you a message to ask about the roads?" "What?! They had just their bikes stolen, I 'm going to help them...." I gave him my contact details quickly but he seemed completely unconcerned by the incident that had evolved over the past 2 minutes or so. "OK thanks, I need to go catch the returning ferry. Nice to meet you!" He hopped on his bike, and sprinted off quickly with his panniers wobbling as he pedalled off. He seemed in a hurry though the ferry wasn't due to depart for two more hours. Mauro returned with his bike and then immediately ran off again to try to find Lucys bike. I used my bike lock to chain it to the hotel sign then jumped on my bike to follow him. But I didn't see which way they went on the maze of narrow streets in this little town. After pedalling round for 15 minutes or so, I returned to the hotel to wait for the Police and to move Mauro's bike to the back of the hotel where it would hopefully be a little safer. As I walked the bikes around the back, I though about the Austrian cyclists strange behaviour. He said "We" are checking out of the hotel. But was travelling alone apparently. Organising my bags in my hotel room now, I though more about the episode. He didn't seem too concerned by the two lads he MUST have seen literally over my shoulder as we talked, riding off on two fully loaded touring bikes that he knew belonged to the couple who had just walked inside. Then his reluctance to help and the speed at which he left the scene made me wonder if he was in some way involved? A knock on my hotel room door a couple of hours later. Mauro came to collect my key to unlock his bike. They were not locals and were being detained in the town jail. How stupid do you have to be to steal a bike on an island where the only two exits are both by ferry are also staffed by security and the Police? The bike was returned with all Lucys gear meant they could relax. And the next day over a delayed breakfast I began the ride to the other side of the Island. 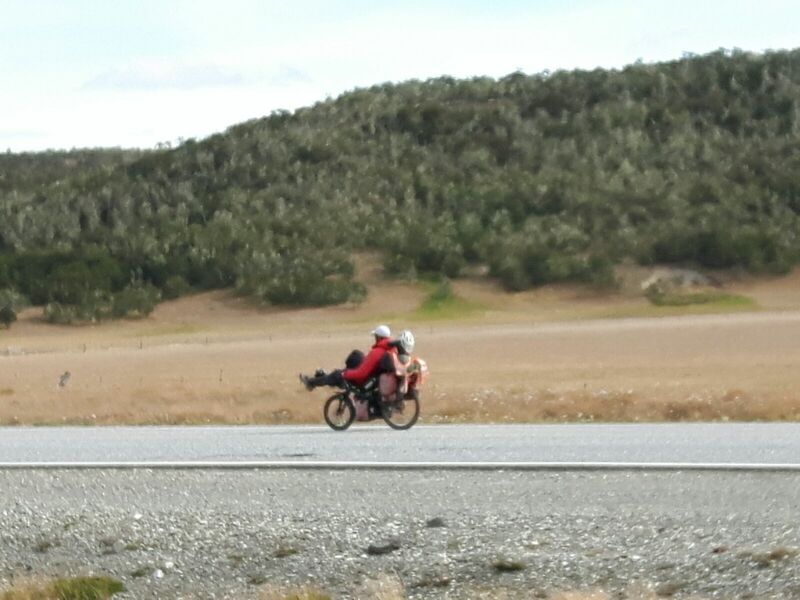 Later I was caught up by the couple who had picked up a passenger and we rode together for the rest of the day. As I continued on dusty ripio roads with a slight tailwind, I stopped on the shore of the bay, as something in the water caught my eye. A mother dolphin was nursing what I thought was just one baby, but later I spotted a second one. I think she had twins? It's times like this I wish I had a proper camera. The Pod of about eight animals were slowly moving through the water. Surfacing regularly for air. I can only guess they were feeding on something below the surface. The road followed the coast and we had both decided to call it a day at a junction on the road at the end of the bay. We had seen a sign earlier in the day telling us there was a cyclists refuge with FREE beds, FREE food, FREE everything! Wow! Too good to be true I thought? But as we passed a few small farms on the road, I was hopeful of a friendly farmer, a warm bed and a hot meal. At least it was warm and dry. Mauro and Lucy had decided to go visit a Penguin colony further south on the island so the following morning we said our goodbyes. The wind had changed in my favour overnight and I sprinted off over the dirt roads and roadworks to the border with Argentina again. A now routine procedure, I passed through the system and had several more exit and entry stamps added to my passport. The staff seemed completely disinterested by the fact I was so close to completing such an epic journey, but given the sheer number or stickers, scrawls and graffiti from thousands of other travellers, that also passed through this final frontier, it was hardly surprising. In Argentina for the final time.The wind was tough going again. Often forcing me to weave over the road. Fortuntely, the traffic was light and I was making good time. But had used up most of my water last night cooking with Mauro and Lucy. In the distance, another Estancia appeared, and as I approched, I called in and asked for a refill. I pressed on through a crosswind to my host home in Rio Grande. Nancy, one of the older couchsurfers I have stayed with welcomed me with a friendliness as if we had know each other for many years. She spent a few minutes pointing out the various things in her home Bed, bathroom, clean towel, kitchen. Then put on her shoes and left for some social meeting. She has hosted over 100 travellers, and was at ease letting strangers into her home. Ambra, an Italian traveller was also there. She had been travelling for almost 4 years, working along the way and was heading north. We had a brief chat as I cooked my Pasta. And as interesting as her adventures were, I was quite exhausted and slept early. On the road to Tolhuin, I was waved down by John and Beatrice who had found another little refuge on the roadside. Elliot was happy playing with the sand and pebbles on the roadside and passed me a small plastic spade and asked me to help him load up his dump truck. But soon got bored and began playing inside the refuge hut instead. As we were chatting, another cyclist appeared and joined in the conversation. "Are you camping here?!" He asked with surprise. "Tolhuin is only 35 Kilometres away and you can camp in the Bakery there"
I didn't know this as, I was planning to find a camp site. And sure enough, when I arrived, a local bakery offered travellers a one night free stop over in a warehouse behind their main shop. 3 bunk beds, a small space with a toilet and shower squeezed in between bags of flour, shelves of eggs, butter and the baking ovens. It was an odd but very comfortable surprise and something that would sadly never exist in England due to health and safety rules. Here I met with Carlos who was the cyclist I met earlier that afternoon, Two Brazilian cyclists, I had previously met in Coyhaique and a French Motorcyclist. Also here was John, from London who was exhausted having only ridden from Ushuaia. It was the end of his first day riding to Lima Peru. He was still nervous about his journey so we spent a long time talking about his road ahead. He was not too happy when I told him he would spend the next 2 weeks fighting ferocious head winds. Elliot and his family arrived next morning and we shared a final goodbye as I set off on the final 100 Kilometres of my entire journey to Ushuaia. Intending to set off early, it was almost noon by the time I left the town. The road climbed over the short but steep Paso Garibaldi and into a headwind as I descended towards the city.